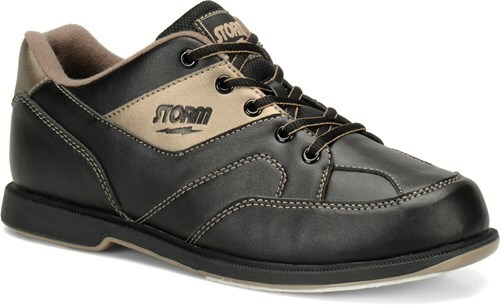 Does the Storm Taren Black/Bronze bowling shoe come in a wide width or just medium? These shoes are for a right handed bowler. The two soles will have universal microfiber soles. There is a one year limited manufactured warranty on all shoes. Unfortunately, these will not be interchangeable. 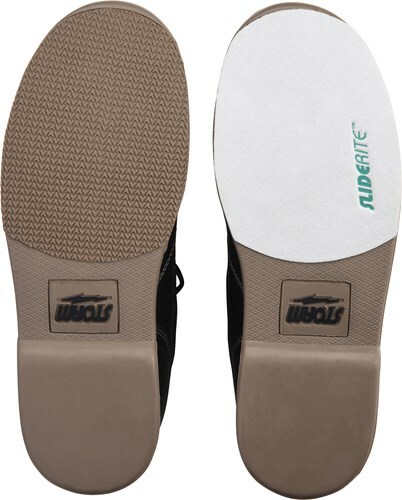 Do these shoes have a slide on both soles or just the right one. These will have a slide on the left foot. It is the opposite foot for a right hander. These will have fixed slide soles. Do I get my regular shoe size or the size of the rental shoes I always get? We recommend getting the size you normally wear. We do offer the True Fit Guarantee option just in case the shoes don't fit for a one time fee of $3.99 and we send you a prepaid shipping label with your shoes so you can use that label to exchange the shoes. This is a closeout shoe so we are selling out of some sizes. Once the sizes are sold out we will remove that size from the selection box. If you see the size you need still listed then we still have that size in stock. The wide width will be a EE width and the regular standard width is a D width. Due to the time it takes to produce the Storm Mens Taren Black/Bronze Right Hand ball it will ship in 2 bus. days. We cannot ship this ball outside the United States.